B&G Sailing Autopilots give reliable control of your boat in the toughest conditions. B&G Autopilots have steered the world's top helmsmen to victory in every one of the world's oceans, and now our racing heritage is available to the cruising sailor and club racer in our Triton2 sailing autopilot range. 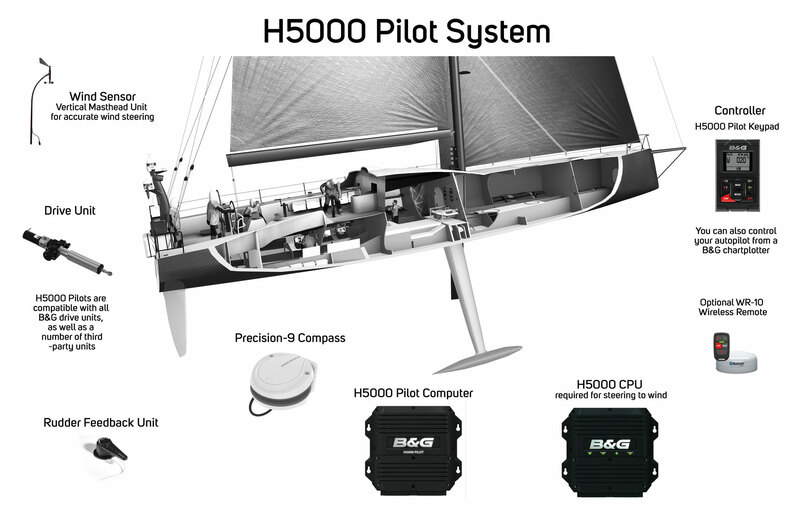 B&G’s H5000 autopilots have been proven in the toughest conditions and most testing environments by some of the world’s best sailors. This race-winning technology is also available for the cruising sailor and club racer in our easy to use Triton² range, so whatever your requirements, B&G have an autopilot system for you. For cruising/club racing installations where you want excellent performance, choose a Triton² Autopilot. 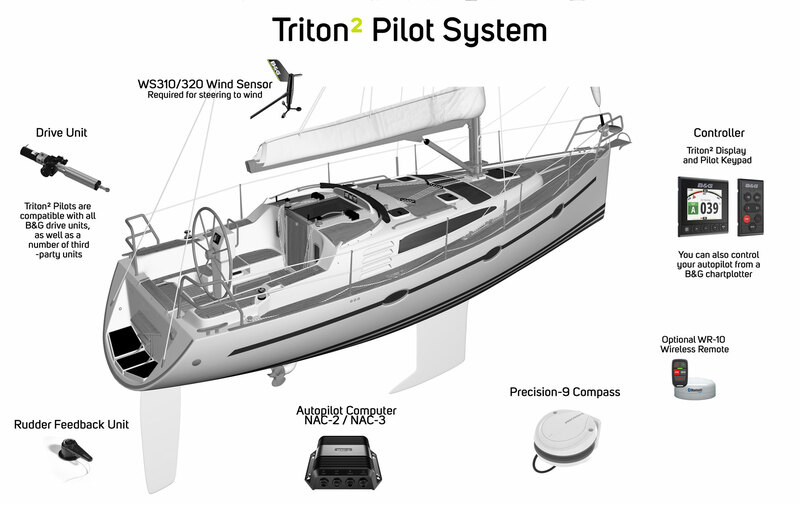 Triton² pilots feature intelligent Sail Steering functionality with compass and wind steering, Smart Manoeuvre controls to tack at the touch of a button, and chartplotter integration to enable waypoint and route navigation. Click to explore the image below and find out more about the components of a Triton² Pilot system. The record-breaking B&G H5000 Pilot features dedicated sailing algorithms and steering modes - Gust Response, Recovery and High-Wind Response. It has been proven in the toughest of conditions and the most testing environments and is ideal for short-handed cruisers or racers. Click to explore the image below and find out more about the components that make up an H5000 Pilot System. B&G navigation systems and instruments are compatible with Simrad Tillerpilots for quiet, smooth standalone auto-steering.